Settle in to one of my lectures which I have been giving since 1995. 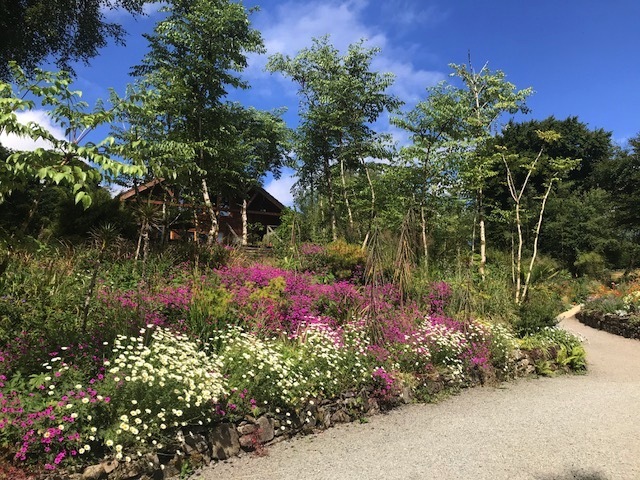 The subjects range from the magical gardens of Ireland, to the enchanting gardens of Scotland and Wales, to Sculpture in the Garden, Poetry in the Garden and my recent and well received lecture. ‘Art & Spirit in the Garden Creating the Inner Quiet Garden Room’ An inspirational and ‘how to’ lecture for the passionate garden whether a beginner or seasoned. More detailed descriptions below. The Glorious Gardens of Scotland is a similar style lecture to the Irish Garden talk. We go around Scotland from Dumfries & Galloway all the way to the Highlands from Macbeths’ Cawdor Castle, some of the Outlander * settings through the magical landscapes and Pictish stones, to the castles and sweeps of heather brushed hills unfolding the landscape and history whilst revealing the stunning gardens which feature the best in this ‘Scottish Style’ Walled gardens, kitchen gardens, fabulous parterres, blending the variety of architectural styles from the tower castles, Baronial Style, The Arts & Crafts, to the High Victorian. I introduce you the the main players and garden designers, old and new who helped set the stage for these wonderful enchanting landscapes that grace the lands below the Blustery North Sea to Hadrians wall, above Northumbria. Garden Tour June 2019 contact me directly for more information . Both an inspirational and ’ How To lecture’ - discussing the importance of focal points and how to use sculpture and art to enhance your garden. Whether your own private garden, a public space, a community project. A religious space. How to go about the process of mindful design and create a more meaningful feature in your garden or institution. We will discuss different kinds of spaces and gardens , healing , memory (a lot more tactile elements) meditative, remembrance, religious , hospice. Important considerations for selection and implementation. This lecture can be customized to a semi work shop mode if your club has a particular project in mind. I will show a number of examples including some of my own work from the Carroll School in Lincoln, The chapel at Wellesley College, two installations at the Massachusetts Horticultural Society. This lecture has been delivered and warmly received at the Philadelphia Flower Show, the Arnold Arboretum of Harvard university and many Garden Clubs. I add new images from my annual trips. The talk is designed in a slow gallop around Ireland where I unfold the story and development of the Irish Garden through the centuries and show how it relates on the world stage in the gardening world. Due to the Gulf Stream, Ireland has a broad palette of zones which allow the extraordinary range of plants that grow for which it is famous for . Looking at landscape and gardens enveloping history and content of the wide range or stunning gardens and people who have helped create and steward them through the centuries, We will see the amazing people who help create them right up to whose current and cutting edge. Some of these folk you will meet on my 2019 Garden tour. Having had a life long love of poetry, reading it, writing It, being inspired by it, being healed by it, comforted, amused and inspired by it. Using it as a tool to synthesize complex thoughts into a more simple design Vernacular. I did this while going through the Radcliffe Design and History program from desertation on a puddle to ‘The Earthly Delights of the Irish Garden’ writing a number of poems pertaining to garden, landscape and sculpture, which I continue to do. The connection between the poetics of garden, poetry in and around the garden is as natural a dance in words, nature along with the magnificence of the intertwining elements of horticulture. Garden as allegory for life. Garden as memory, a dreaming place. Through time we can see and feel through the lens of the poets- It was a very popular and private pastime through the centuries, capturing capsules and intimate moments. I recall being weaned on Kate Greenway and Cecily Parker. Growing up in Ireland with Yeats, Kavanagh, Gerald Manly Hopkins, Colerdige to name a few. We will look though a number of images pertaining to the garden inspired by and for poets and painters, and writers. This will be developed Into a ‘how to work workshop’ To help ‘fill your quill and gather your inspirations, sow the words and reap the fruition of your thoughts. With my background as an artist/sculptor and garden designer, a graduate of the Landscape Design and History Program of Radcliffe at Harvard University, I share some of my process and practical ‘how to’ ideas intended to access new and deeper elements that will help you create a meaningful garden within your garden. In my instructional lecture, I draw my inspiration from art and poetry, Ancient Ireland, Scotland and other places from my journeys. How to consider a whole other experience in your garden, whether a new space or a new place. Come away with thought provoking ideas The one garden room or space that even garden should have whether in your personal garden at a school, library or the downsizing from your home to the new living communities. Using mindfully selected, plants and shrubs, materials, lighting, sculpture , water and other embellishments while sharing the road map I developed on how to gather and create a ‘quiet and meaningful garden room’.